Amos Yadlin, former director of Israeli Military Intelligence, January 2012. 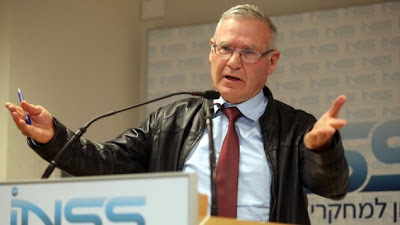 Former Israeli Military Intelligence chief Amos Yadlin, who is currently the Director of the Institute for National Security Studies (INSS) at Tel Aviv University, declared today that Iran is rapidly approaching the so-called "red line" of nuclear weapons capability and would reach the breakout point within two months. Speaking at an INSS event, Yadlin stated that Iran has already enriched enough uranium for "six bombs," yet apparently failed to point out not a single atom of such material has been enriched to anything close to weapons-grade and all of which remains under the safeguard, seal and surveillance of the IAEA. "We are heading toward a collision course by the end of the year," Yadlin said, insisting that "Israel will, in fact, be the first to have to reach a decision. It is not party to the negotiations. At the Iranians' current rate of production, even to those who today are saying they won't cross the red line – there is no doubt that by the summer they will cross it." Of course, there is not one intelligence agency on the planet that has assessed Iran has an active nuclear weapons program. Just last week, U.S. Director of National Intelligence James Clapper reaffirmed the long-held conclusion that no decision has even been made by the Iranian government to pursue the development of a nuclear bomb and that any such move would be immediately detectable to IAEA inspectors and the international community. Such alarmist nonsense is unsurprising, especially when considering the source. Yadlin has a history of making things up. In March 2009, shortly after Israeli Prime Minister Benjamin Netanyahu told a U.S. Congressional delegation that Israeli "experts" estimated Iran was "probably only one or two years away" from achieving nuclear weapons capability, Yadlin - then the IDF's Military Intelligence Director - told cabinet ministers that Iran had already "crossed the technological threshold" needed to "achieve the capability to manufacture a nuclear bomb." In early 2010, in a statement before the Knesset's Defense Committee, Yadlin said Iran would likely be able to build a single nuclear device that very year. He was wrong. After leaving the IDF, Yadlin took up a fellowship position at the hawkish Washington Institute for Near East Policy, an AIPAC-affiliated think tank, before returning to Israel to head INSS. Roughly a month and a half ago, on February 4, 2013, Yadlin unveiled another prediction. "Iran is currently four to six months away from nuclear breakout stage, if an order is given to reach that phase now," he declared, according to reports in the Israeli and international press. The estimate came on the heels of news that Iran was planning to substantially upgrade its enrichment technology with more efficient equipment. At the time, Yadlin also said that a diplomatic solution to the Iranian nuclear issue was preferable that resorting to military means and envisaged an agreement that respected Iran's continued ability to enrich uranium domestically through the possession of 1,200 centrifuges. If Iran's enrichment capacity were slowed, limited and regulated, thereby - in his estimation - enabling "a couple of years [to] separate Iran from nuclear breakout, that would be a better solution than a military attack." Now that another couple rounds of negotiations have come and gone, with no discernible progress made, Yadlin believes a military confrontation is inevitable. Israelis now only have until the summer "to sleep soundly," he said, referring to the upcoming Iranian presidential elections set for June. The election, according to Yadlin's infinite wisdom, will determine whether Iran will decide to weaponize its civilian nuclear program. At the same INSS event, a Russian analyst suggested it would take Iran at least seven years to build an actual nuclear bomb. No doubt, we can all safely doze off for a few more weeks until Yadlin returns with yet another prediction from his crystal ball. A report in the Jerusalem Post contains a quote from Yadlin's presentation at the INSS conference which tempers somewhat the hysteria of his "two month" timeline, while simultaneously making it even more irrelevant and meaningless. "By the summer, Iran will be a month or two away from a decision about the bomb," Yadlin is quoted as saying. So, rather than the initial reports claiming that Yadlin's timeline had to do with crossing a "red line" of stockpiled uranium, it appears he that his reasoning is actually more convoluted. The Iranian presidential election is slated for mid-June. After that, Yadlin says, a "decision about the bomb" will be made within two months. Uh, okay. Why? Who knows!? So, nearly two months from now Iran will elect its next president. Then, one or two months after that the Iranian leadership will make a determination about whether or not to start the process of building a nuclear weapon. Even if this weren't completely nonsensical speculation unsupported by any facts, why this is interesting or useful information is unclear. Beyond this, Yadlin also claimed Iran has stockpiled enough 3.5% enriched uranium for six bombs and nearly enough 20% enriched uranium for one bomb. As stated above, none of this is weapons-grade and can only be used - without further enrichment detectable by the IAEA and Western intelligence agencies - for energy production and medical research. "They have no problem reverting back what they allegedly turned to nuclear fuel. Within a week it could be turned into nuclear material for a bomb," Yadlin stated, even though it appears no honest nuclear expert would back this claim up. Quite the contrary, manufacturing fuel plates from 19.75% enriched uranium, as Iran has done, virtually precludes its reconstitution as uranium gas to be further enriched. The process is not so simple and, again, would be easily detectable.